(#117) Alex: What about raccoons? I'll miss our old place. 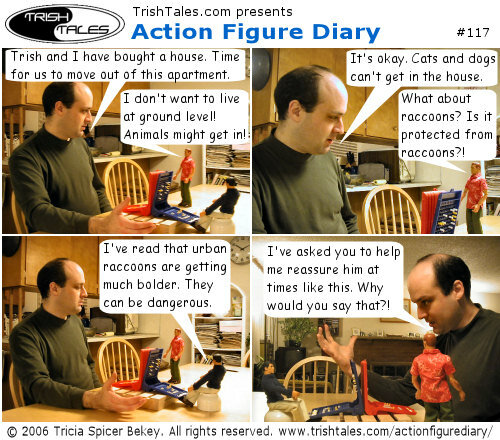 Action Figure Diary was born there. I know I'll find great shooting locations in the new house, but it's a shame I won't be able to reuse most of my old shots. This is the first time I've lived on the ground floor since being traumatized by multiple break-ins years ago. As I was planning the storyline to transition the characters to the new location, I decided to use Alex's fear of being more vulnerable to animals as a parallel to my own emotional journey. Well, since Lisa and Jane will be with him, Alex doesn't have to worry about skunks. CYs work with skunks in the skunks unceasing battle against werewolves. So that is 2 dangers that Alex won't have to be concerned about.